Home > Event > Dave takes on a loop the loop flying challenge! Dave takes on a loop the loop flying challenge! 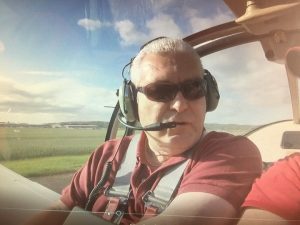 At the weekend, our supporter Dave took on a sky-high challenge in aid of our charity! Let me introduce myself, my name is Dave Parker and I don’t like flying. The day has arrived, its 6am and I haven’t slept a wink. The reason, today is the day I will be doing a loop-the-loop as a passenger in my bosses plane. To make matters worse it’s a 60 minute drive to get to the airfield near Rugby and as each mile passes I keep thinking of a reason to do a U-turn. I decide, I can’t do that as a lot of people have paid a lot of money to charity to put me through this ordeal. Never a fan of flying, even to go to beautiful places on holiday the informal chat with Duncan (my boss) over a cup of coffee re-enters my mind “Dave” said Duncan, “if you don’t like flying why don’t I take you up for a spin in my plane”, “OK” I said jokingly, “and while we’re up there we’ll do a few tricks”. Laughingly I agreed, thinking this will never happen, until Duncan put date in his calendar. Now there was no getting out of it. I arrive at the airfield on the most gorgeous day you can imagine, blue skies, no wind and a couple of fluffy cotton wool clouds dotted in the sky and I again try to think of any excuse not to do it. After a quick walk round the plane to ensure that it had wings and wheels and a propeller, our checklist was complete and it was time to climb into the cockpit. 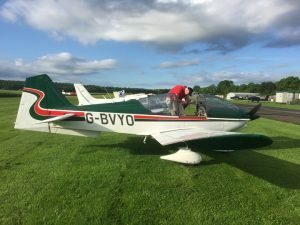 At 6ft 3, it was snug to say the least, and as we rolled down the runway I’m sure I could hear the plane creaking under the weight. We take off, after what seems an age and with the runways end fast approaching, and gently rise into the clear sky. Duncan then talks me through exactly what we will be doing and what I can expect, the one thing I keep repeating In my head is Duncan’s final words “Whatever happens do not touch any of the controls”. We start off with a gentle barrel roll, where we twist through the air, to ease me into things and the experience of being upside down with the countryside above your head is very strange. This was swiftly followed by a snap roll, the same as a barrel roll but it’s done in 2 seconds. Then came the loop-the-loop and even though Duncan told me I was still surprised that you start of going down, before pulling up into the loop. 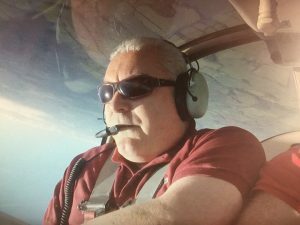 Duncan had one further trick up his sleeve, the hammerhead, as he took the plane up into a vertical climb until the engine cut out and then we rotate so we are facing the ground picking up speed until the propeller kicks back in as fuel reaches the engine. Never have a I been more scared than when the sound of the engine cuts out at almost 4,000 ft.
My time in the air was coming to an end and even though I am glad to have experienced it, I think I will stick to A TUI Airways 787 in future. My target was to raise £1000, and I’m almost there, for the Family Holiday Association, who are TUI UK & Ireland’s chosen charity partner, so donations are still welcome here should you wish to donate. I chose the charity as I really appreciate the work they do in helping families take much needed breaks in the UK and I believe that having the opportunity to spend time together as a family should be available to everyone, regardless of your situation.